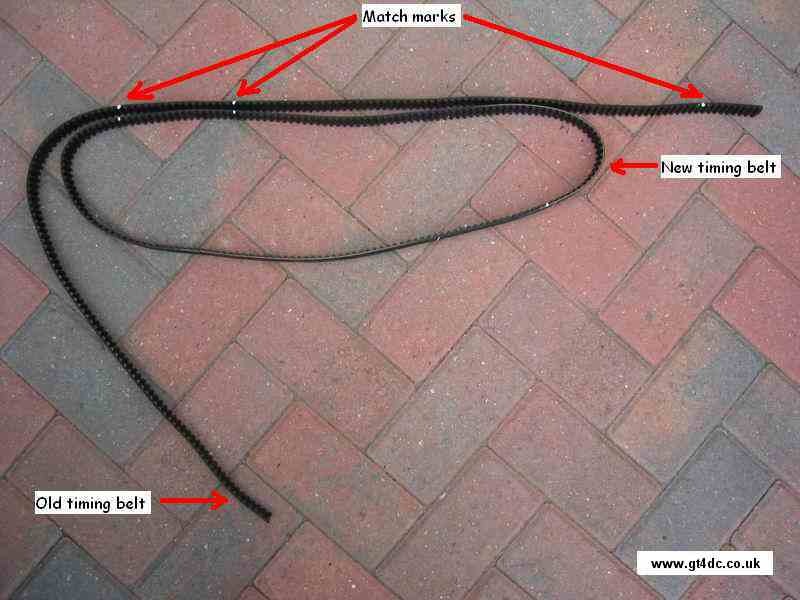 This article is intended as a helpful guide and shows how I replaced the Cambelt. If you are in any doubt, or not qualified, do not undertake this maintenance, consult a qualified mechanic. 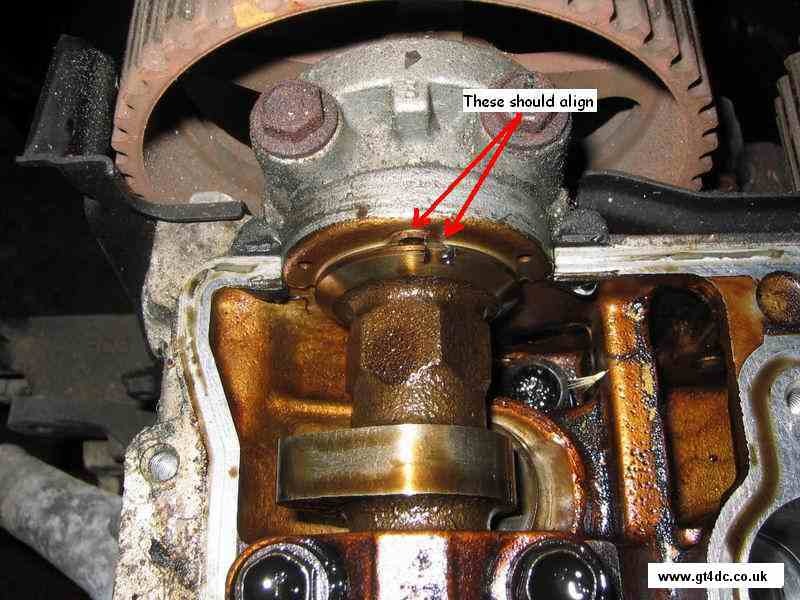 The Cambelt is a critical engine component, failure to change this in accordance with the relevant manufacturers and/or procedures and/or instructions can lead to severe engine damage/failure. The author or the GT4 Drivers Club cannot be held responsible for any loss or damage resulting from use of this article. What models of GT4 does this guide cover? This guide has pictures from a ST205 without ABS. The ABS system makes no difference to the replacement of the cambelt but it does make access more difficult, especially when removing the top cambelt cover! 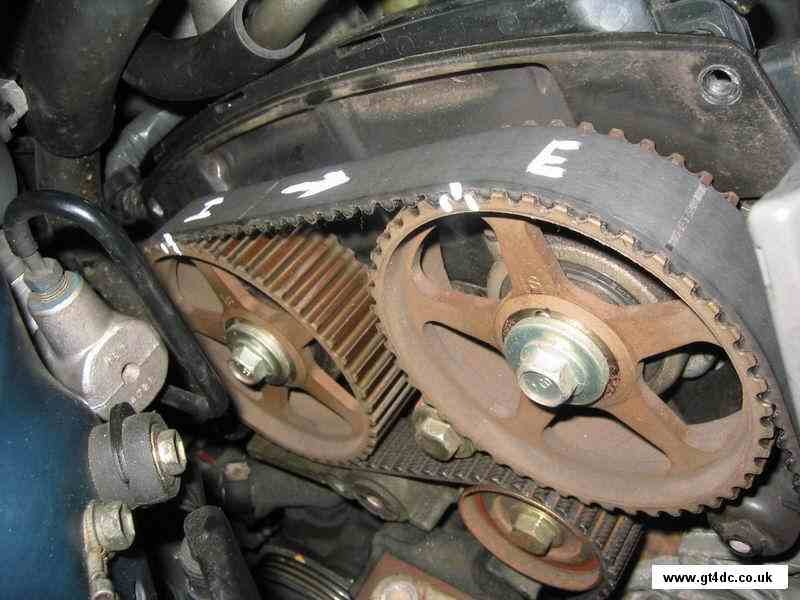 Why do I want to change my Cambelt? 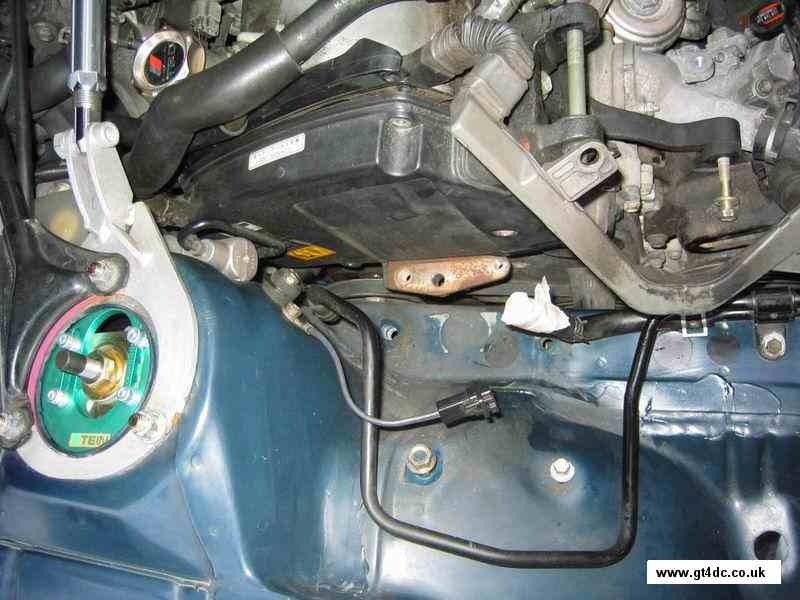 This is part of routine maintenance and the majority of cars run a cambelt which requires routine replacement. The interval at which this is replaced varies from car to car, but for the ST205 it should be replaced at approximately every 100,000km or 60,000 miles. It may also be worth considering replacing the cambelt before the recommended service mileage has been reached. I would think that changing the belt every 5 years is a sensible period of time. I've heard that it's advisable to change other "stuff" when I do the cambelt? 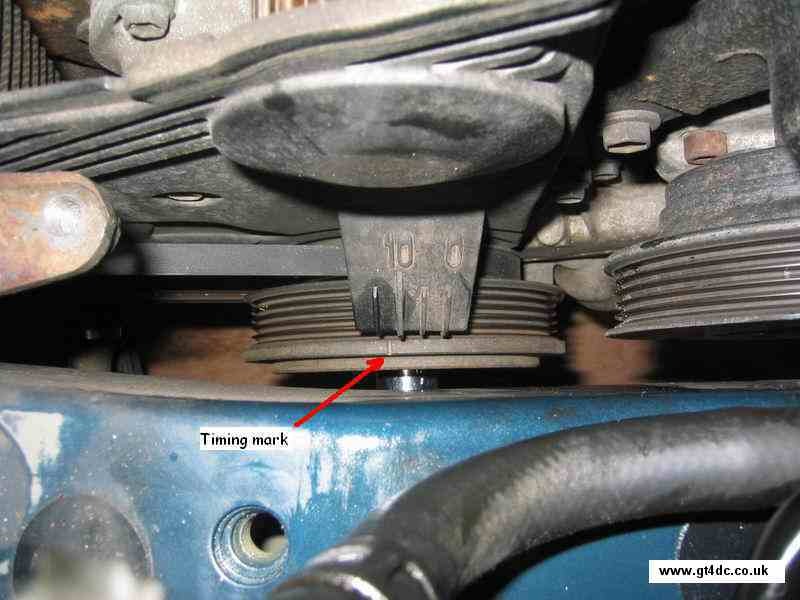 Idler pulley - the bearing wears and it will eventually fail, but prior to that it will probably squeak! 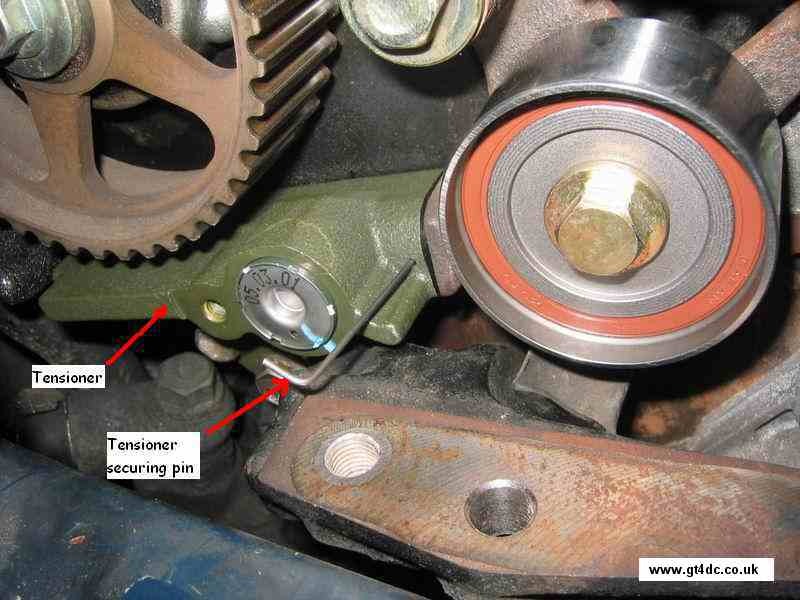 Tensioner pulley - the bearing wears and it will eventually fail, but prior to that it will probably squeak! 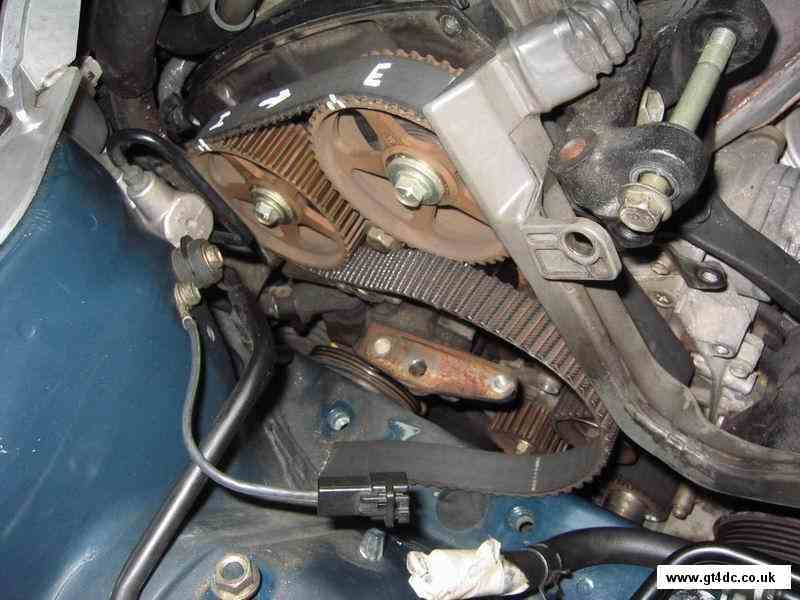 Alternator belt - you have to remove this anyhow. 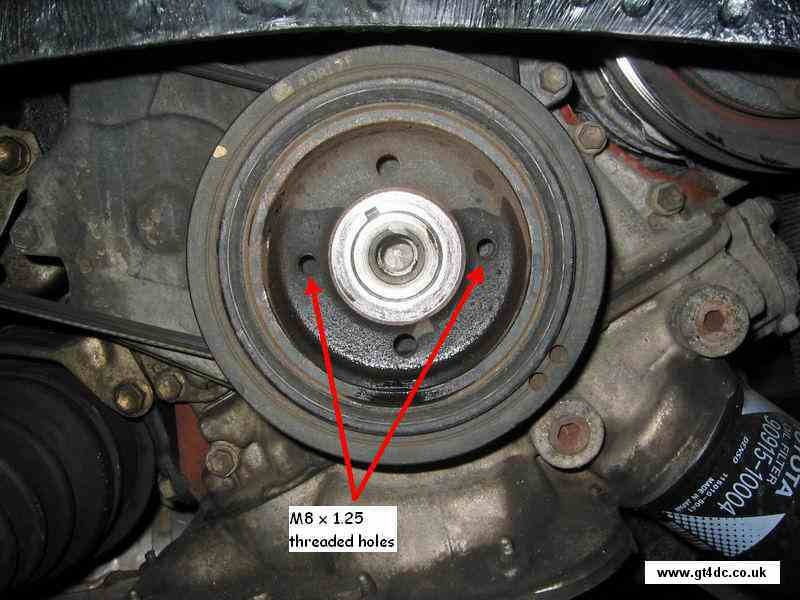 Alternator belt Tensioner pulley bearing - not essential but these also wear and squeak. 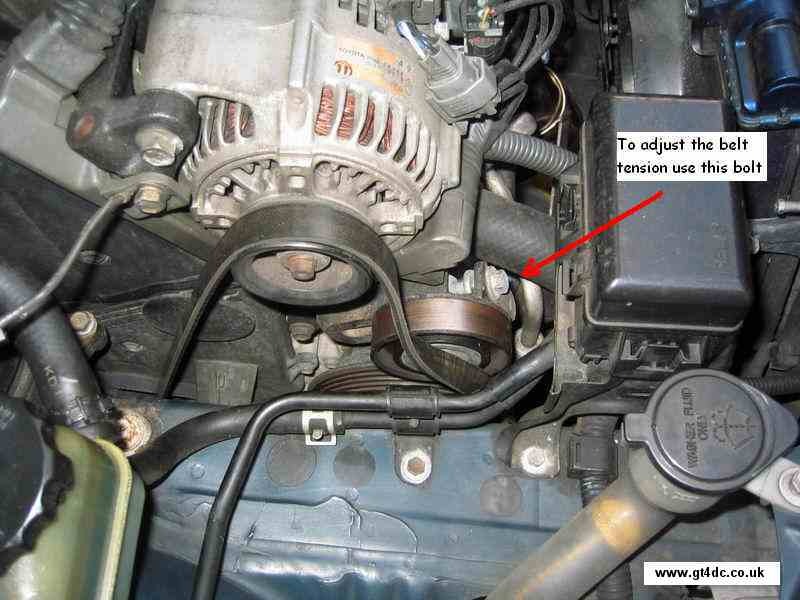 Power steering belt - again you have to remove this to change the cambelt. 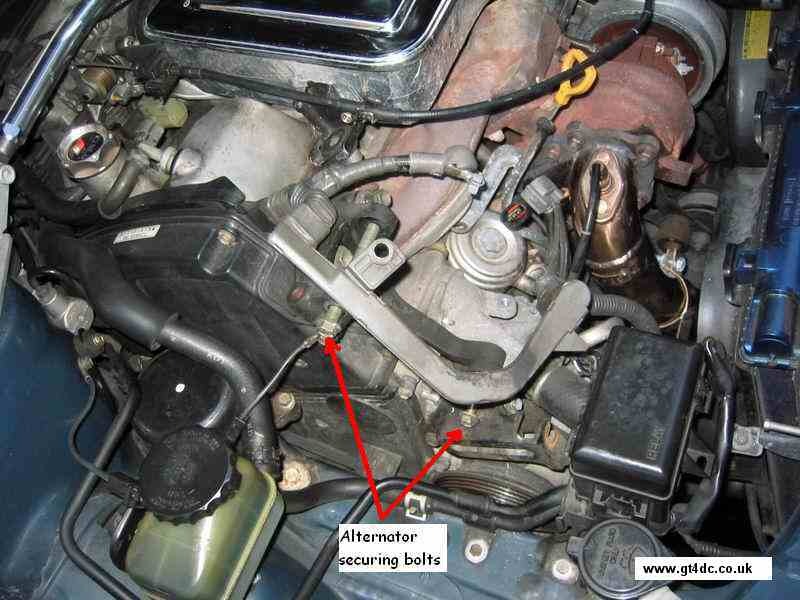 Replace the thermostat - seeing as though the cost is small ~£15 and the alternator has to be removed, you might as well! Ok, what things should I know before I dive in! Take your time, don't rush and work methodically. Have all the spares in your hands before you start! 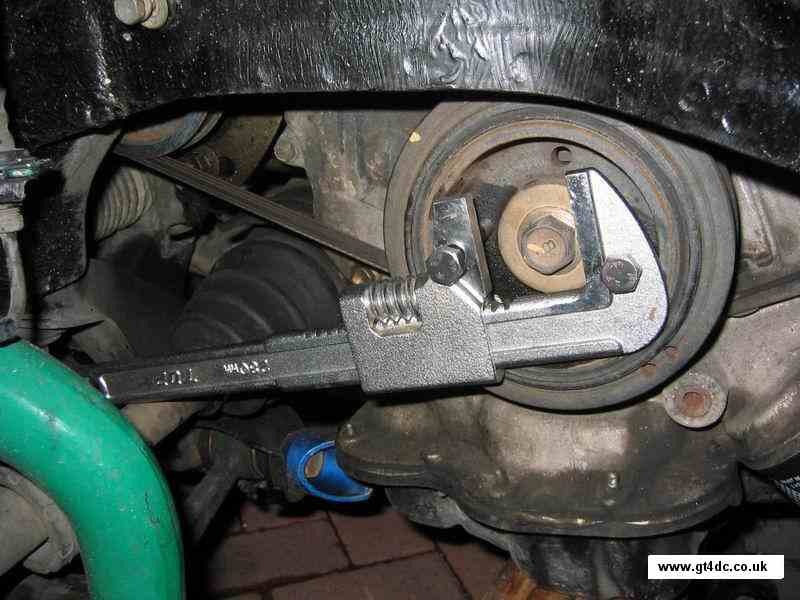 Make sure you have something suitable to remove the crankshaft pulley nut - see the write up for my "tool". The worst part of the job is removing the top cambelt cover. The Toyota BGB article seems to me to be a bit awkward, I wouldn't follow it. 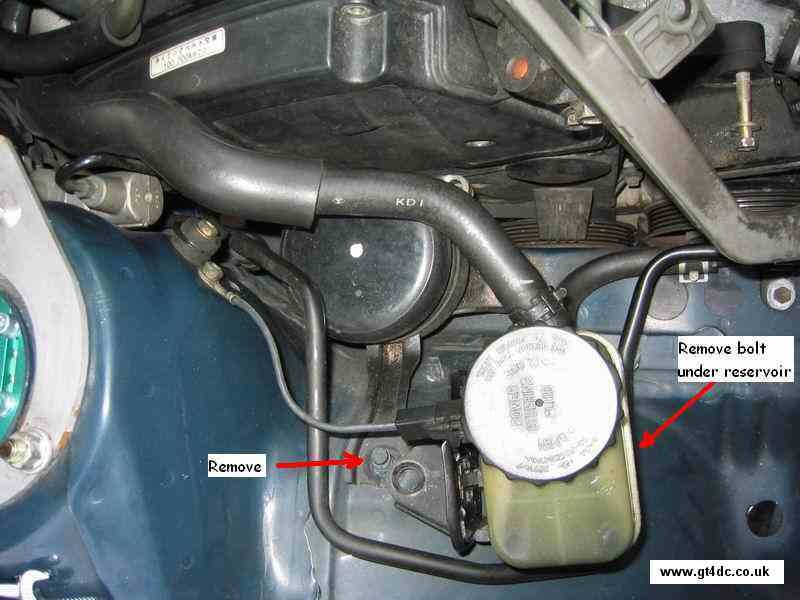 Undo the lower hose from the power steering reservoir and drain the ATF from the hose and reservoir and dispose of the old fluid. 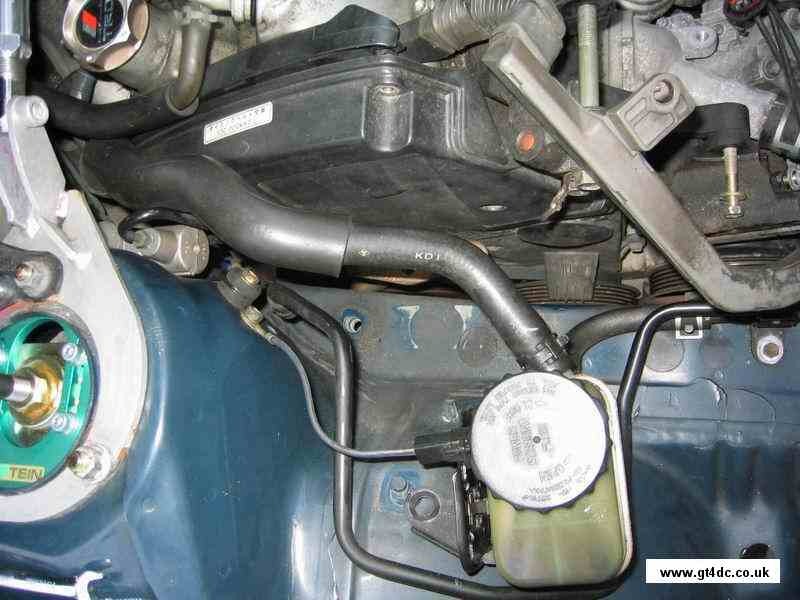 Then, remove the reservoir completely - I also covered the ends of the hoses to prevent ingress of crap! 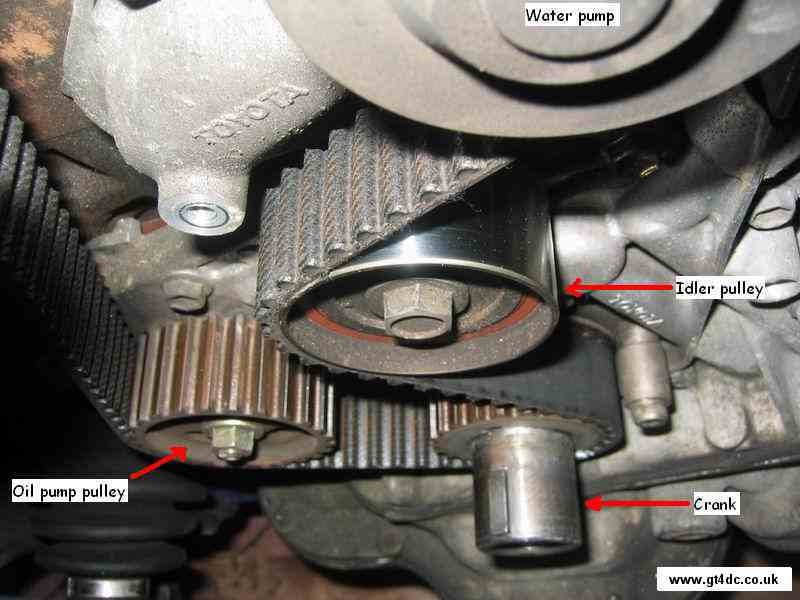 Place a socket onto the crank bolt and turn the engine over (turning the engine over clockwise), until the crank pulley is aligned with the zero mark and also so that the camshaft pulleys have the "dot" at the top of the pulley, as shown. Now it's time to bring out the special tool to remove the crank pulley! 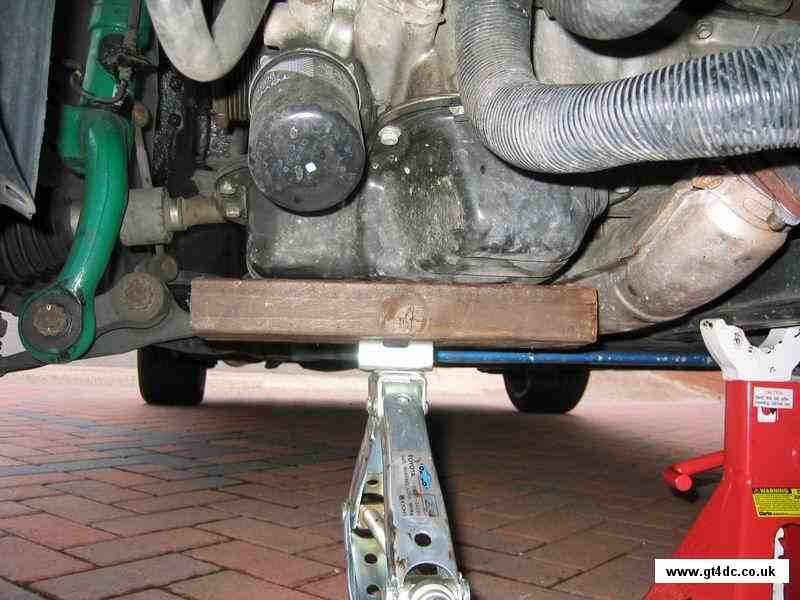 The tool is the cheapest and poorest quality adjustable spanner you can find. Into this drill 2 holes to accept a couple of M8 x 1.25 bolts which screw into the threaded holes in the crank pulley. 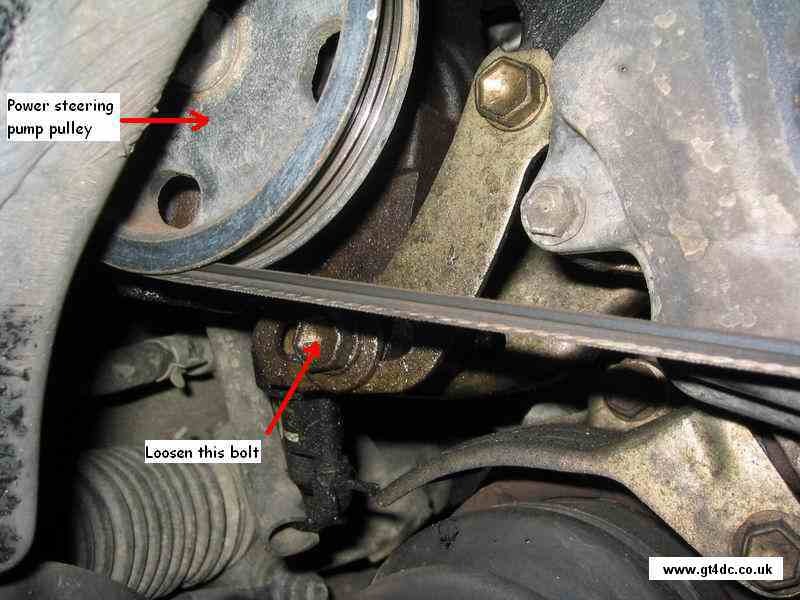 The power steering belt requires removal before the crank pulley is removed. Either cut this off or, slacken the tensioning bolt and swing the pump towards the front of the car - note every belt I have done has been stiff to move and requires some "persuasion"! 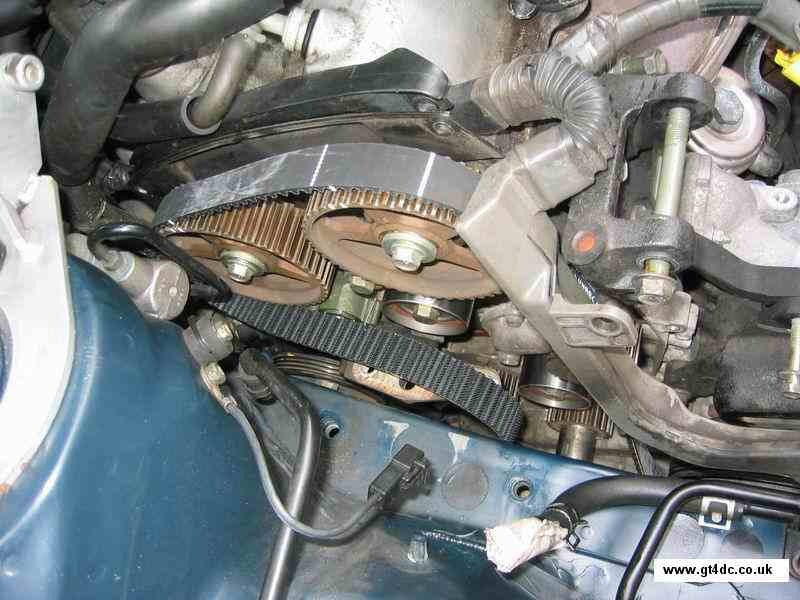 The lower timing belt cover can now be removed once the pulley has been taken off. Note that the crank pulley woodruff key may come loose - don't loose it! With the cover removed the first thing to remove if the "Dished washer". NOTE THE ORIENTATION OF THE WASHER i.e. the dish faces away from the engine. Incorrect later fitting of this washer may spell doom. 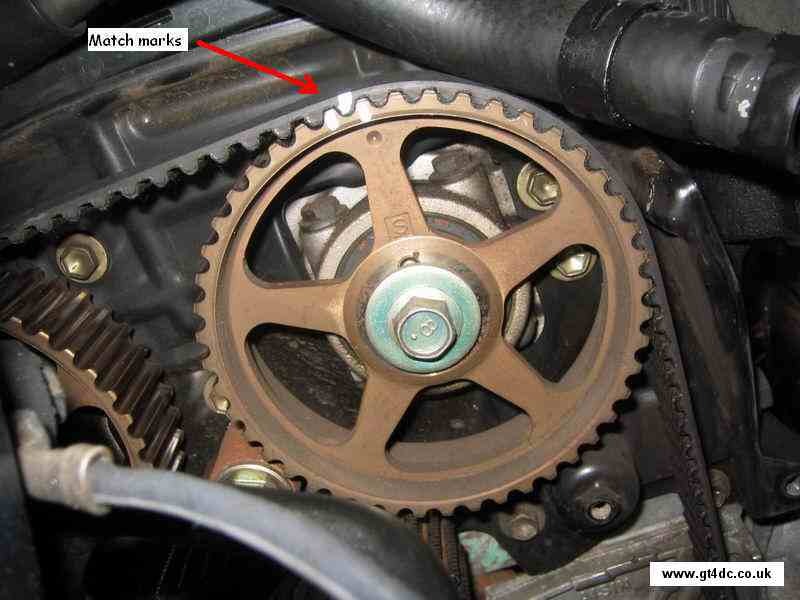 While you are at the crank, place some match marks on the old timing belt, either side of a mark on the crank with a marker pen or Tippex. Note from this point onwards, do NOT move either crank or camshafts, or you will have to verify that the timing is correct! Check, check and double check that all the match marks are lined up and are clearly visible and unambiguous, this is your last chance to ensure it goes smoothly! 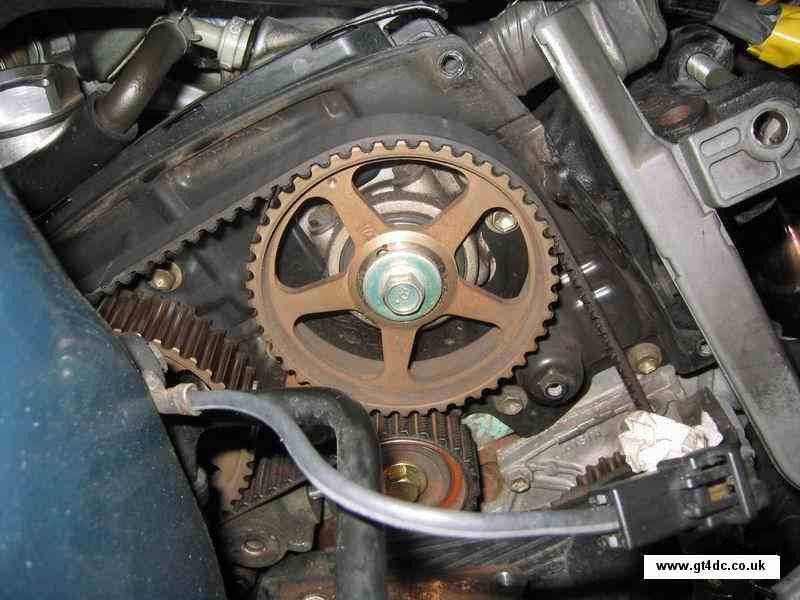 Simply pull the timing belt free from around all the pulleys and sprockets. 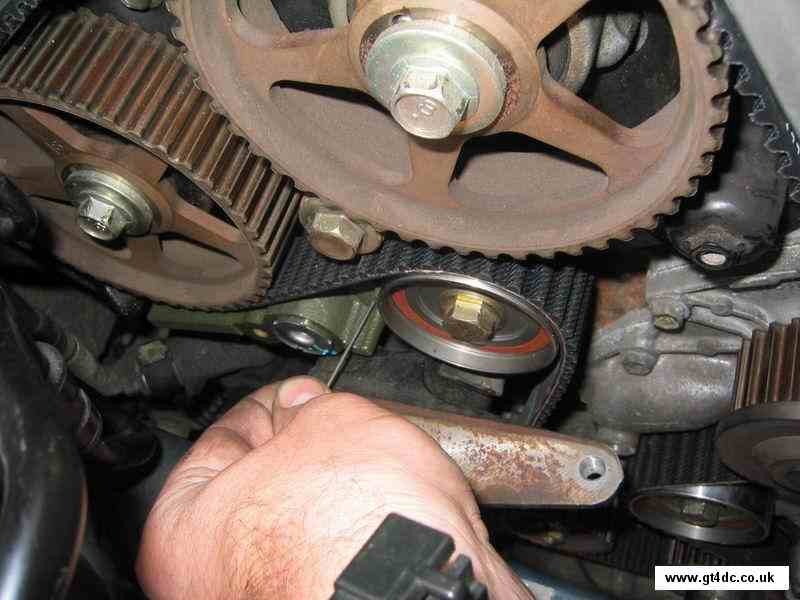 Note that the camshaft sprockets WILL move due to the tension of the valve springs and the belt, do not panic, you have the original positions marked on the belt you are removing! Before refitting of a new belt the old worn components need to be replaced. 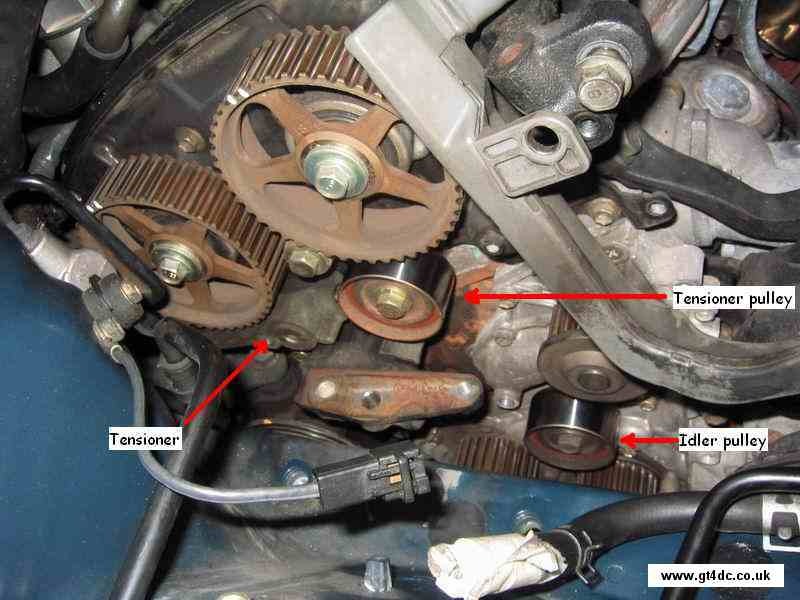 Indicated are the Tensioner, Tensioner pulley and idler pulley. 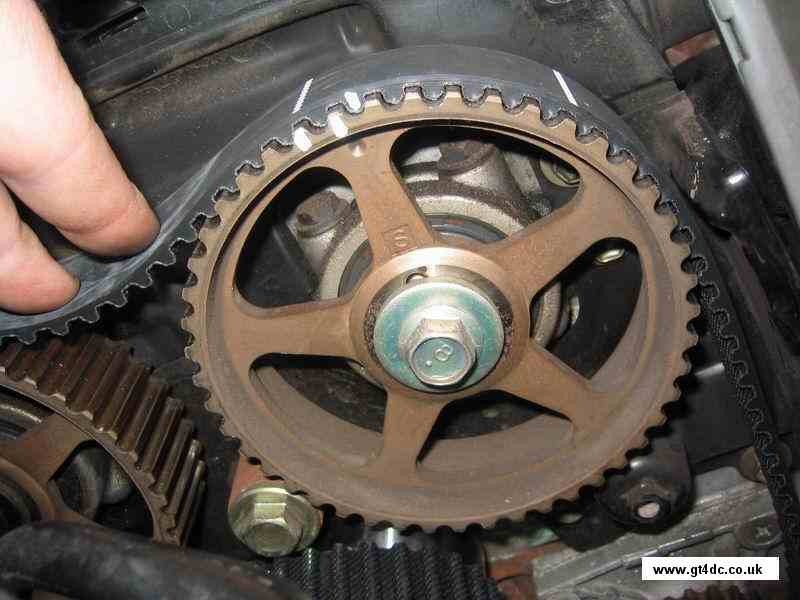 Note that you may have to put the belt on at an angle on the inlet and exhaust sprockets in order to get the belt onto all the pulleys! Note that the picture shows how far misaligned the timing can easily become. Expect to rotate the exhaust and/or the inlet sprocket at least 1 or 2 teeth - this can give you the feeling you have fouled up, you haven't! Once the match marks have been checked, double checked and then checked again you can pull the pin out of the Tensioner assembly. 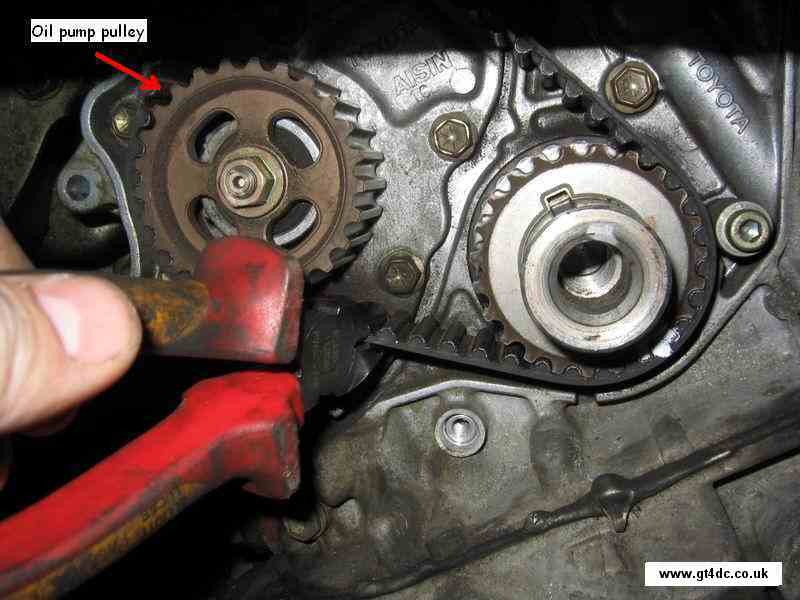 By rotating the engine using the crank pulley nut you should see the slack disappear. Re-fit all the items removed, and ensure the "Dished washer" is put back in the correct orientation. Ok, I've done that, but the car runs very badly and I see to be down on power! I'd suspect you have done the job wrong and either the inlet or exhaust cam is 1 tooth misaligned! 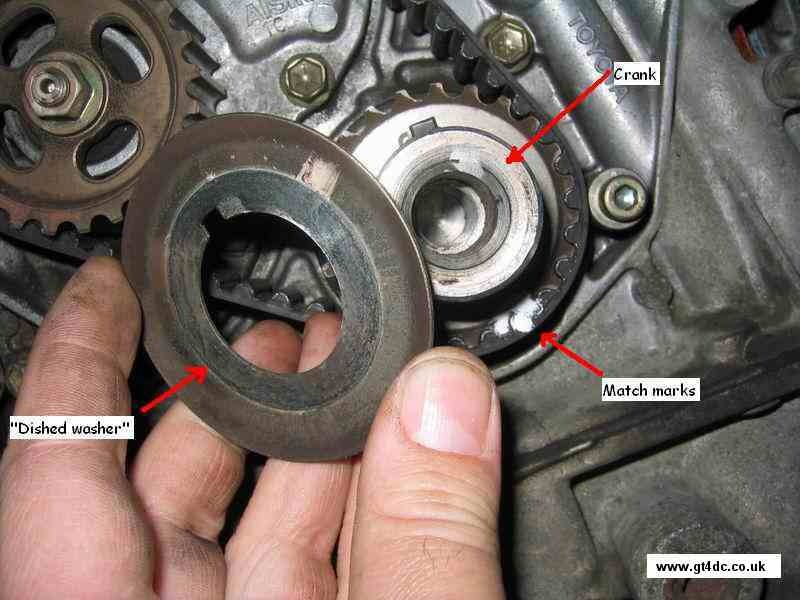 You will find the match marks on the head and the sprocket very hard to align with the engine still in the car. 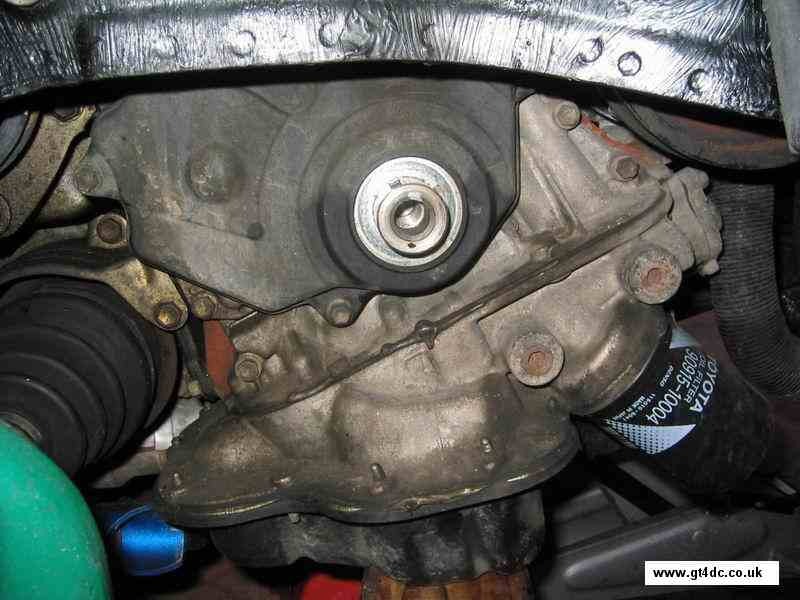 An easier method is to remove the rocker box cover and inspect the camshaft by the sprockets. There are some much clearer markings to help align the timing. I removed the pin from the Tensioner but I've realised the marks now don't line up! No problem. 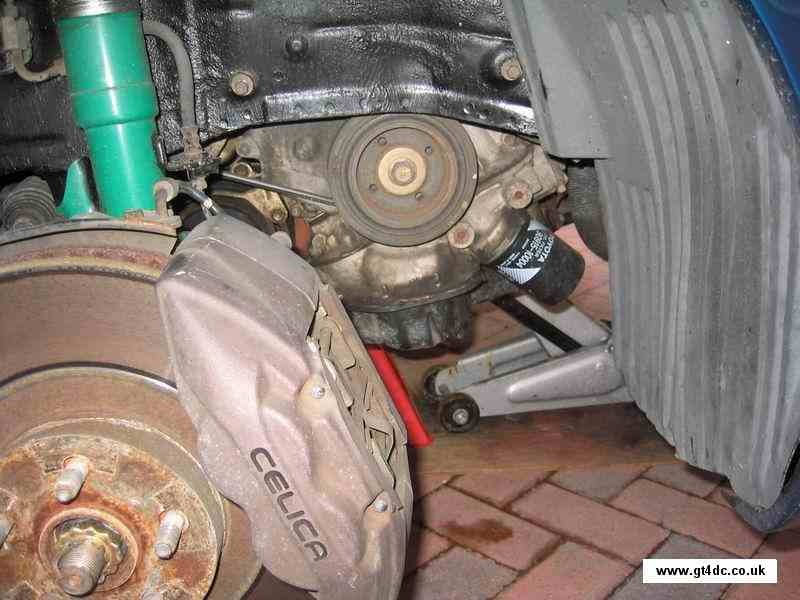 Attach a socket and a breaker bar to the Tensioner pulley and gently press downwards. This will act to push the Tensioner plunger back into the Tensioner assembly. 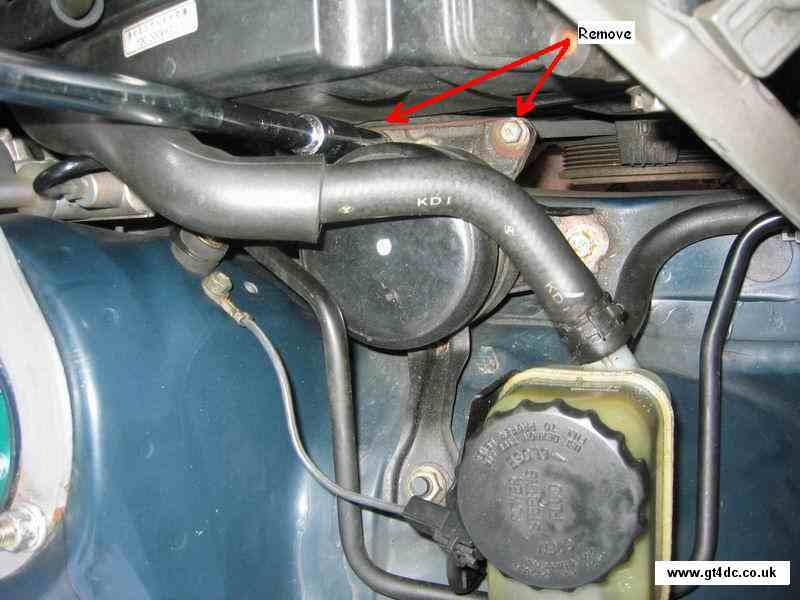 This is a fairly slow process to push the Tensioner plunger back into the housing, but as this plunger moves back you should reach a point whereby you can re-insert the pin - you should now have some slack back in the timing belt. If you have lost the pin you can put in a 1.2mm Allen key or a little smaller in order to keep the plunger held back. Anything else I should do once I have done the cambelt? 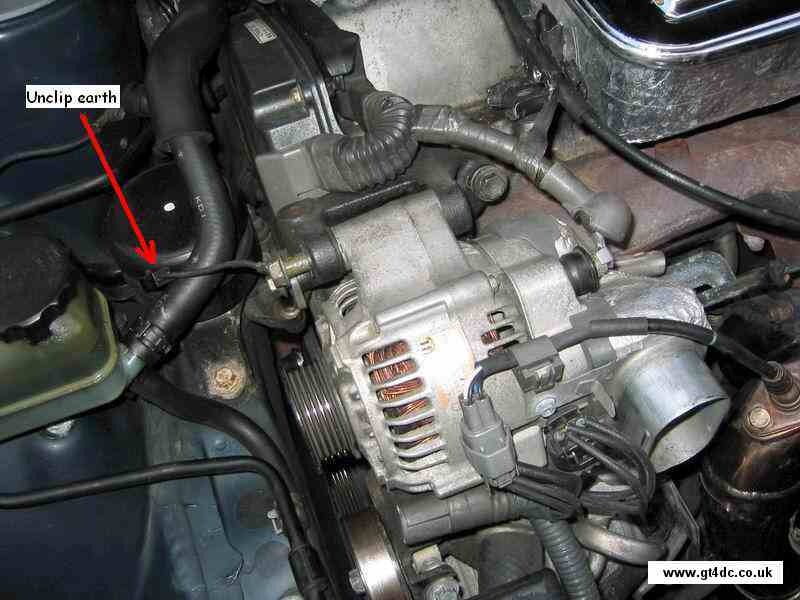 Yes, check the ignition timing.